Many people do not realize you have until April 15, 2018, to fund an IRA account, which in many cases could reduce your taxable income. Saving for retirement has many benefits. Yet, many still fail to save for their retirement, for reasons that may sound good but are in fact detrimental. This article contains four genuinely good reasons to save for your golden years ahead. WT Wealth Management can assist you in self-directed retirement plans, such as IRAs and ROTH IRAs, along with company and self-employed plans, such as Simple IRAs, SEP IRAs, and even solo 401K plans. Funding a retirement plan is the smartest, most cost-effective way to grow assets, thus to secure and insure a comfortable post-career life. To not depend solely on the American welfare system to bankroll your retirement. To compound your returns on your investments with tax-deferred savings. Do those reasons sound better than your excuses? Let's explore each one. Although many people depend on the welfare system for emergency financial assistance or as a stepping stone toward financial independence, it's dangerous to make the welfare system your sole source of income when you retire, as it would crimp your lifestyle considerably, and you may not even be able to afford to meet your fundamental needs. 2. To spare you the necessity of living with your children simply because living on your own is unaffordable for you. If you have children, you probably wouldn't mind spending as much time with them as you possibly can. But, for the most part, you probably also want that to be at your discretion, for most people don't want to spend their golden years living with their grown children, whether they welcome you to live with them or see you as an unaffordable encumbrance. Such financial dependency also means you renounce your independence to live as you please. earnings are compounded on earnings, resulting in higher dividends than on taxable savings accounts. 3. To lower your income taxes by putting money away in a tax-deferred IRA. If you make deductible contributions to a traditional IRA, it reduces the income you have left, because you must take funds from your savings to make those contributions. If you make salary-deferral contributions to a company savings plan on a pre-tax basis, this reduces the amount of take-home pay you receive. However, the net effect is less than the amounts you contribute to these plans, because the amount by which your income is reduced is less than the amount you contribute. John's annual salary is $50,000, at a 25% income-tax rate. He is paid every week, and 10% of each check, or $96, goes into his 401(k) account. This reduces his paycheck by a mere $72. Ellen's annual salary is $100,000, at a 28% income-tax rate. She is paid every week, and 10% of each check, or $192, goes into her 401(k) account. This reduces her paycheck by a mere $138. You thus save $49,035.31 in taxes by investing in a tax-deferred account, as opposed to a regular savings account. 4. To compound your returns on your investments with tax-deferred savings. If you add your savings to a regular savings account, the earnings that accrue on those amounts are taxed in the year those amounts are earned. This reduces the amount you have available to reinvest by the amount of taxes you must pay on these amounts. Net $617,767.55 from a tax-deferred account. Net $568,732.24 from an after-tax account. These figures increase with a longer earnings period and a larger amount saved. The above examples show the compound effect tax-deferred growth creates, which attests to the appeal of IRAs and employer-sponsored 401(k) and similar plans. Roth IRAs can offer tax-free options. As such, if you are eligible for a Roth IRA or work for an employer that offers Roth 401(k)/403(b), you must carefully determine which is more suitable for your financial profile to maximize the financial security of your retirement. Plan now, save, and play later, with more money. WT Wealth Management can help you design a plan and strategy to start your road toward a comfortable retirement. Appleby, Denise. 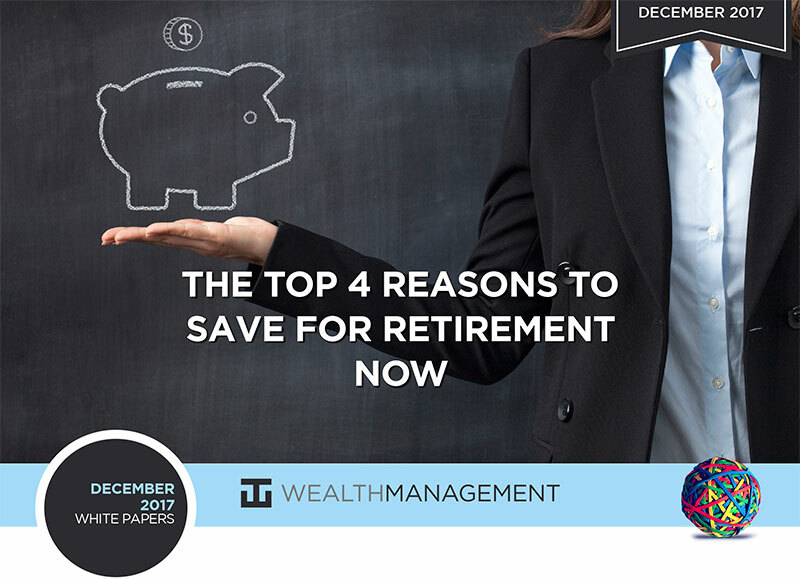 "Top 4 Reasons to Save for Retirement Now."